Today, our lives and our communities face unprecedented and never-yet-experienced challenges. Our future is hurdled with mega-sized seemingly unresolvable issues such as the uncertainty of our employments caused by the enduring global economic depression, inequality that reached a level no longer acceptable, generational friction and the concerns for the future that arise from the never-heard-of population structure change, and the climate change and ecological crisis, which are now urgent present day issues. A thinker once said, “Human raises only the problems one can solve because problems arise only when the physical conditions for solving the problem already exist, or at least are being formed.” This argues that if there is a problem, then there is a solution, and I believe that we should be at least as optimistic as what this argument preaches. We should look at the world with the conviction that “an alternative exists.” If we cannot create a “completed blueprint for reformation,” then we could search for other solutions. For example, we could seek little milestones that are on the way to the future filled with hope, and as we go along we could assemble our map for the future little by little. Maybe, the blueprint for the future in the 21st century cannot be created as we take an aerial photo from a high blue sky, looking down upon and through everything at once. We already know that numerous “completed blueprints for reformation” from the last century that promised us a rosy future were vastly incomplete from their very beginning. Then, shall we call the new way—not the one-shot, aerial picture that is already complete, but the street view way, where we take one step at a time and find little milestones to assemble our map—“Social Innovation”? I believe that this will be another way to improve our lives and change the world.” Social innovation could be the hidden key that will enable us to open the window of hope from the cube of despair in which we are entrapped. Innovations in our daily lives will reveal innovations for the world. Although social innovation is not a magic spell that will give us an aerial photo that could show us everything in a society in a glance but is a guidebook that will enable us to build a street view beginning from where we stand now. This system allows women to collect their parcels when they want to do from unmanned parcel boxes installed around their home. The Seoul Metropolitan Government first introduced this service in 50 areas in July 2013 and expanded a total of 160 as of 2016. A step with deep concern toward disadvantaged groups, it is the beginning of social innovation. This project encourages the elderly who live in a university town to lend spare rooms to university students. It offers a regular income to the elderly and a residential space to university students at an affordable price. For the elderly and the youth who are faced with a gloomy future, their unexpected cohabitation can be the beginning of a surprising change. Public bicycle rental system, Seoul Bike, started in 2015 when 150 rental stations were set up in five areas, including Sangam-dong, Yeoui-do, and Sinchon with 2,000 bicycles. In 2016, it attracted approximately 100,000 citizens as members enjoying high popularity. Normal life with Seoul Bike, it is the environment that we have to protect for long. Crime Prevention Through Environmental Design (CPTED) was first adopted in Yeomni-dong, Mapo-gu and now expanded to 10 areas in Seoul. Character wall paintings, lightings, music, SOS emergency bell, and CCTV cameras all help protect residents on the streets. According to the Korean Institute of Criminology, the CPTED proved effectiveness in crime prevention by 73.8%. What do you think about changing fluorescent lights in the underground parking lot and each household to LEDs? What about installing a mini solar power plant in the rooftop and veranda of your house? Energy independence that will guarantee a bright future starts on our fingertips. Energy-independent villages started from approximately by 1,000 households—residents of Seongdaegol Village and members of Seongdaegol Children’s Library at Sangdo 3 and 4-dongs, Dongjak-gu in 2012 and now a total of 55 villages have adopted the system. The B.I. is composed with six straight lines and symbolizes two corners of an open space. The lines symbolize gathering and cooperation, the intersection represents a new connection and various points of contact, the gaps in the corners mean open possibilities and creation by the community through a passage of time. 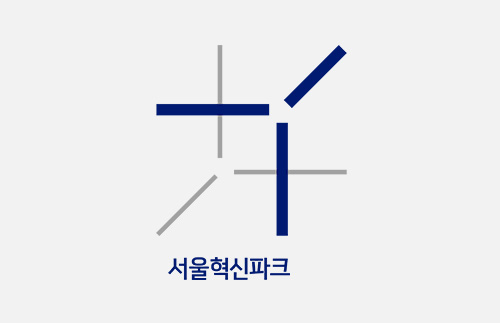 Seoul Innovation Center was established in April of 2015 pursuant to the “Seoul City Ordinance on the installation and the operation of Seoul Innovation Center” and is operated by “Social Innovation Space There (www.facebook.com/platformthere),” a non-profit corporation, through 2018 pursuant to a public bidding. 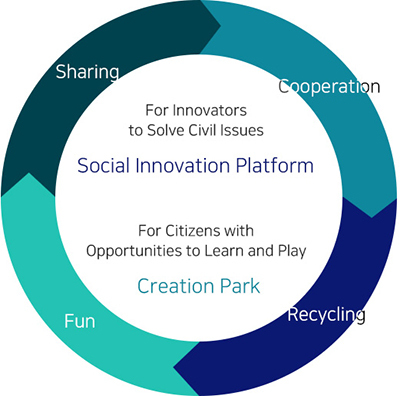 Seoul Innovation Park finds innovators, shapes an environment where innovators can embark on new experiments based on a connection of their experience, and strives to be a group of coordinators, who disseminates the resulting solutions for social issues to the society. at the Exit No. 2 of Bulgwang Station (Line 3 and 6).